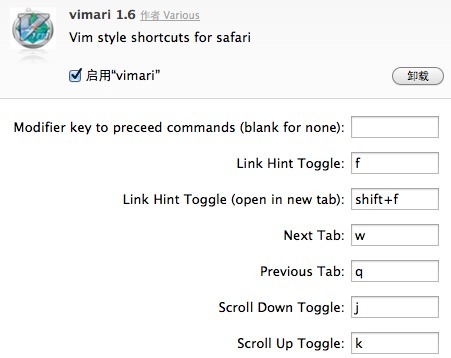 Vimari is a Safari extension that provides keyboard based navigation. The code is heavily based on \’vimium\’, a chrome extension that provides much more extensive features. Vimari attempts to provide a lightweight port of vimium to Safari, taking the best components of vimium and adapting them to Safari. 稍加配置，我就很容易获得了和后者类似的使用体验。例如下图的配置选项中，我把 Modifier key to preceed commands 这一项留空，按下f键就可以选择打开页面上的某个链接，而不是使用它默认的快捷键ctrl + f.